It takes a lot of work to provide high quality and informative articles, so if you have found the information on this site helpful and enjoyable, please consider making a donation or buying one of my e-books (9 Essential Life Skills or The Ultimate Guide to Self-Confidence). I am extremely grateful and appreciative for your encouragement and support! To donate please click the button below which will enable you to make a secure PayPal donation via online transfer, credit card or e-check. 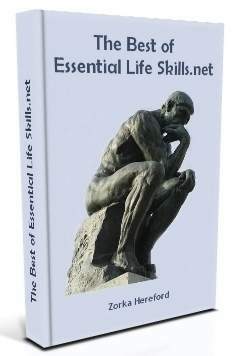 Buy the book '9 Essential Life Skills"
Also for a $5.00 donations receive "The Best of Essential Life Skills.net" for some of the best articles on personal development you will find! Click on the book below if you would like to make the $5.00 donation and receive "The Best of Essential Life Skills.net".